Hi friends! I'm back on the blog talking about my beauty favorites captured by my friend Brenna from BMB Photography. I'm always telling my friends, buy less and buy better. It's my moral for shopping in all aspects of my life and especially beauty. So these beauty favorites are more like beauty essentials that are close to my heart right now. 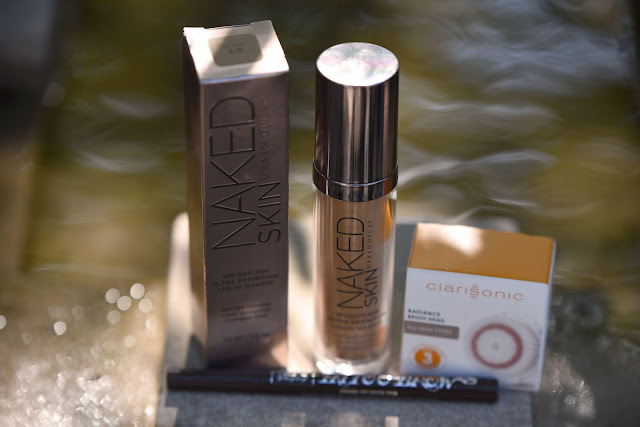 Urban Decay Naked Skin Weightless Foundation- Pretty recently I decided that I didn't need a full coverage foundation everyday since my skin has gotten significantly better throughout my twenties. (God bless a strict nightly skincare regimen catching up 5 years later). I'd always wanted to try the Naked foundation but the price tag was always one of my biggest hesitations. I was running low on my Sephora Collection foundation and honestly really sick of it, it wasn't giving me the coverage or pigmentation I wanted so I finally decided to bite the bullet and try this foundation and I was amazed at the coverage. For my normal skin I feel like its really beautiful and has a high coverage look but not feel, and I use so little! Shade 4.0 is giving me life, I'm amazed at how close the color is to my face/neck. Clarisonic Radiance Head- I've been trying to get back into the habit of using my Clarisonic Mia 1 on a daily basis. I've noticed that my normal skin has needed the extra exfoliation more regularly. I wanted to try this radiance head and its perfect, this head has soft bristles and does a good job cleaning your face and removing dullness. This head also works with all Clarisonic facial devices. Kat Von D Tattoo Brow- I love keeping my brows natural and couldn't imagine how much upkeep it would take to get them constantly done. I do trim my eyebrows with cuticle scissors and just lightly fill in the front of my brows. I usually use a e.l.f. cosmetics eyebrow kit but ever since I found this KVD Tattoo Brow for $5 at Marshalls I've been loving it! This summer is shaping up to be a busy one for me.! I'm also loving Peach Citrus Infusions from Starbucks, my Anastasia Beverly Hills Modern Renaissance Palette, eBay fashion, SUITS SEASON SEVEN, and Queen of the South on USA! See you on Saturday, we'll be celebrating Five Years here at JMC! What's are you loving right now? Thanks for stopping by Lili! Love them Maggie, thanks for stopping by! Its amazing! This foundation doesn't oxidize as much as the other UD foundation! The Naked Skin foundation is good enough for me to shoot in/do a TV segment in, despite not being a true "HD coverage" foundation! It's so lightweight, too- I love it! Me too Ashley, I haven't worn it for a photoshoot because its not quite the coverage I like for photos but I plan on it soon! Such a great foundation.